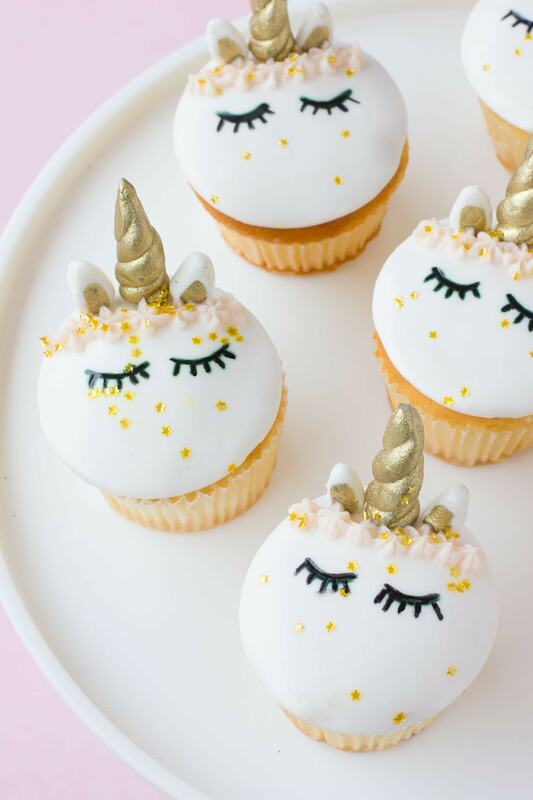 Who else has unicorn cupcakes on their 2017 baking goal list? ME TOO! But now I can finally check this one off! ;) Does anyone else feels that this is the OFFICIAL hottest year ever for the unicorn trend? From donuts, cakes, cupcakes, interior decor…you name it, it’s taking over the internet! This year we shared this unicorn cake and Claire has even debuted her unicorn rocking horse not once…. not twice… but three whole times! We even ended up getting one for my niece, June! It’s one of those things you will end up keeping for ever and passing down generations. 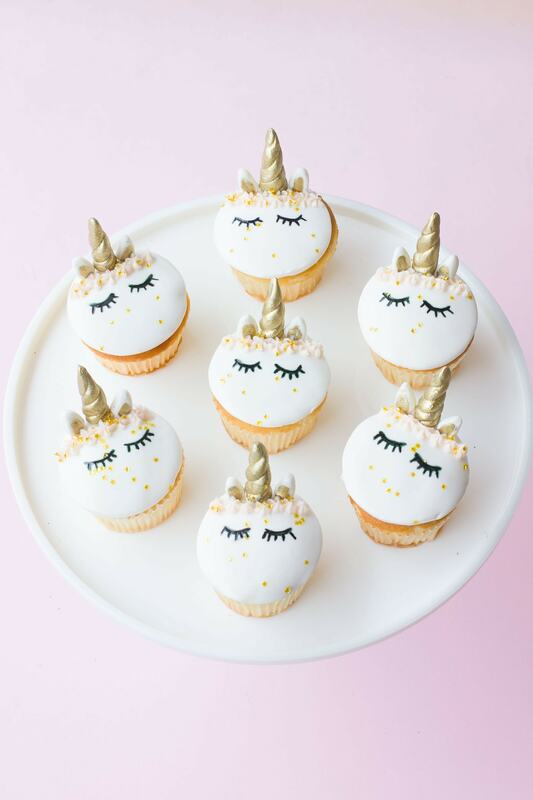 I’ve received several requests from friends to bump up the party with more unicorn desserts so here I am. ;) I ended up making these for my niece’s birthday party and the kids just had a blast with them. I have to be honest, I don’t always bake every single recipe from scratch here at BFFF. Once in a while, we take short cuts and don’t get too heavy into the recipe development side. 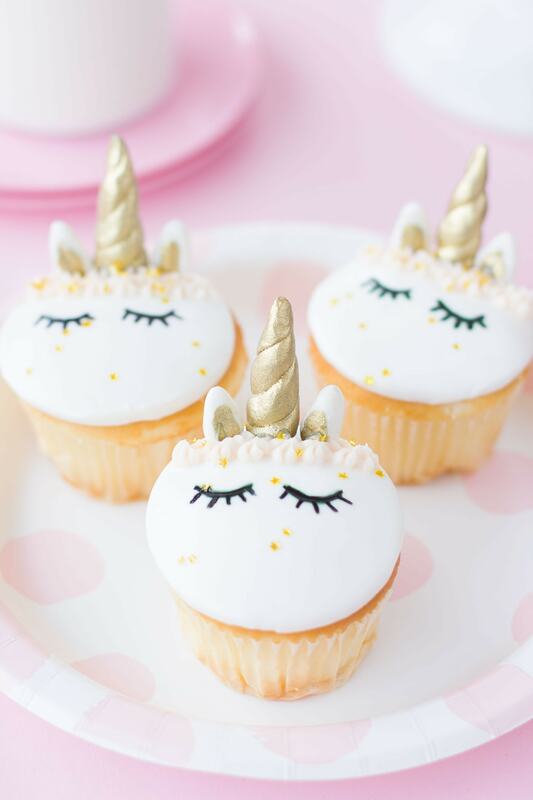 For example, for these cupcakes, I was in a time crunch, so I went to the grocery store and got plain cupcakes (yup, just ask the bakery department and they’ll usually give you a discount). I had some leftover pink frosting from the rainbow cookies we made and made a whole hay day out of it! ;) Okay, I am stretching that just a hair. These cupcakes took me about an hour to put together. Who else has a fun party coming up that these would be perfect for? 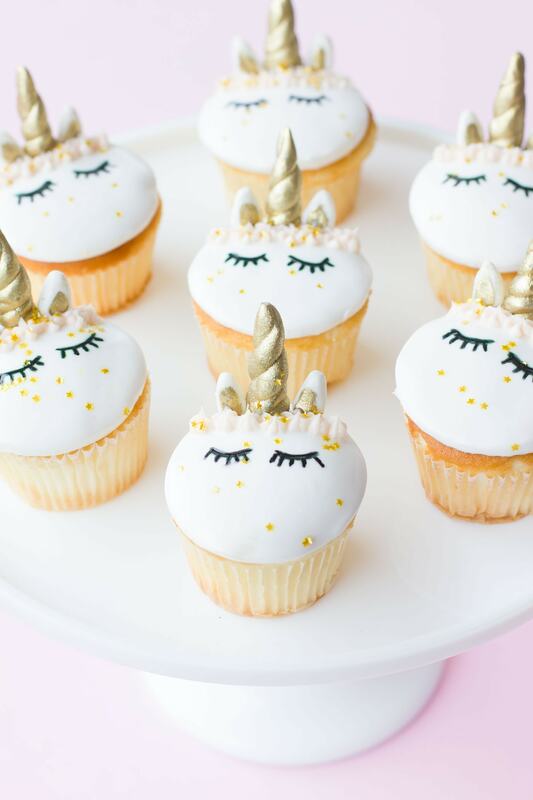 Bring on the fondant and unicorns horns! Roll out your fondant and cut out twelve circles. 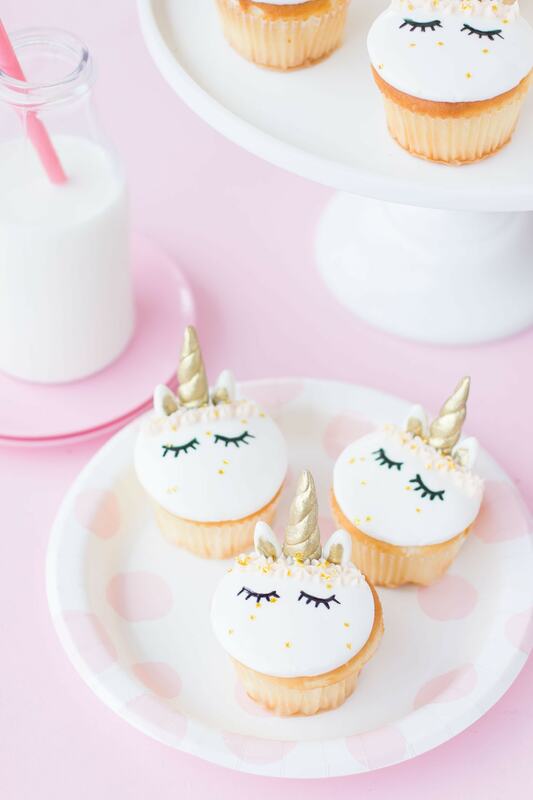 Also use your fondant to create the unicorn ears and horn. Next, take your toothpicks through the bottoms of the ears and horn. In a small bowl mix together the gold luster dust and a small teaspoon of water to make the gold paint. Use your gold paint to paint the entire horn and the inside of your ears. Place your fondant circles on top of your cupcakes, then stick your horn and pair of ears into the fondant. Using your edible black pen draw eyes and eyelashes. Make your light pink buttercream frosting by adding one drop of pink gel dye to your white frosting. Put your pink frosting into your piping bag and make a line across the top of the unicorn just below the horn. Use your frosting to make tiny dots along your pink line to create a floral crown. 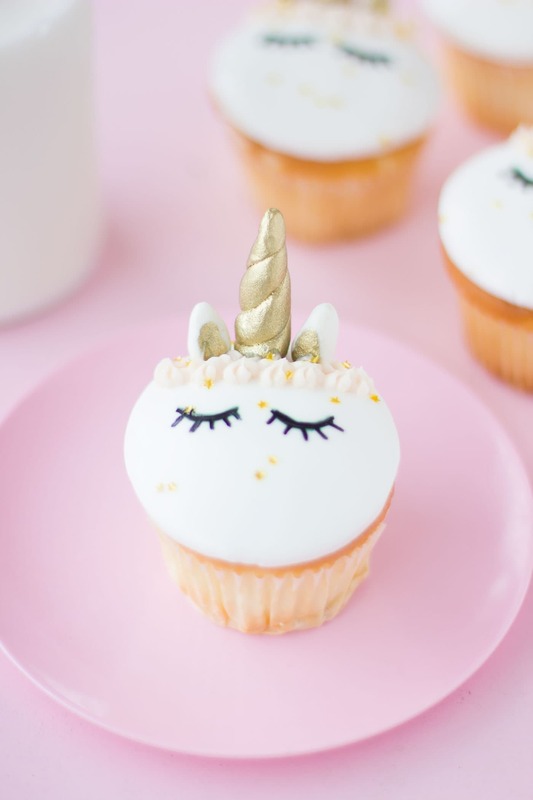 Sprinkle your tiny gold stars onto your unicorn! Place half of the powdered sugar and the meringue powder in the bowl of an electric mixer. Whisk together well. Turn on mixer (use whip attachment) and, while motor is running, slowly stream in the water. Mix until everything is incorporated. Turn mixer to high speed and whip until stiff peaks form. Add flavorings and mix well. Change to paddle attachment (for stand mixer) or dough hook (for Bosch). If using a hand mixer, use the same beaters you were using before. Add remaining powdered sugar and shortening and whip for 2-3 minutes more.